The Seatcraft Signature Monaco home theater seat boasts a striking look that will accommodate guests for years to come. This seat is constructed from Grade 7000 leather, for a luxurious sheen that is picked from the top third of all hides. The seat backs of the Monaco are firmly bolstered, with adjustable power headrests that let you find and switch positions with the simple push of a button. Wooden accents lend the armrests a natural yet classy sense of character. Ambient base lighting adds an azure marquee accent, while lighted cup holders keep beverages secure and within arm's reach. Each armrest flips up to reveal plenty of in-arm storage for an easy cleanup of essential items after use. An accessory mount attached to the armrest expands the range of entertainment opportunities at your fingertips, by letting you attach any number of exciting accessories including wine glass caddies, tablets, reading lights and more. Taken together, its eye-catching look and plethora of features make the Monaco a must-have among the Seatcraft line. 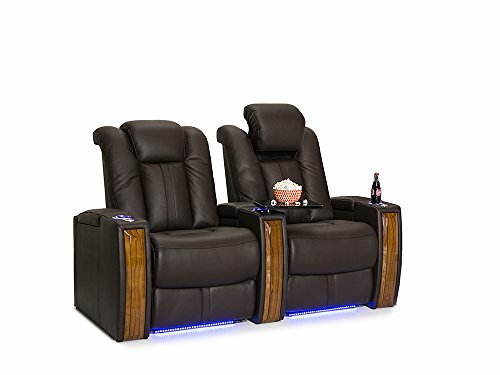 For a real cinema experience in the comfort of your home, these chairs are powered by SoundShaker, a solid-state amplifier system that transforms low frequencies from your movie audio into a tactile and dynamic movie-watching experience where “feeling is believing.” Every car chase, every explosion, every roar of the crowd will practically put you into the movie like never before. It hooks up to your audio receiver (major brand audio receivers are compatible) and wirelessly sends the signal to each of your seats for an enhanced depth that you’ve never experienced while enjoying blockbuster movies. All you need is to add the SoundShaker amplifier for only $399 (sold separately, available on Amazon) to enable this amazing experience. Dimensions: Width 70.5", Height 42.5", Depth (upright) 41", Depth (fully reclined) 69"